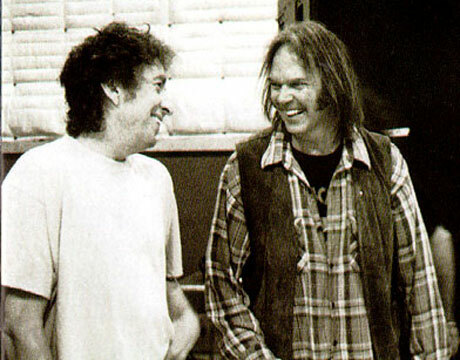 Neil Young is maybe the best interpreter of Bob Dylan’s songs, and it is so fitting, he is after all one of the “holy trinity” (with Dylan and Springsteen). Here are some great versions, sometimes alone and sometimes with other great artists. Neil Young performs a cover of Bob Dylan’s “Blowin’ in the Wind” at the Farm Aid concert in Saratoga Springs, NY on September 21, 2013. Farm Aid was started by Willie Nelson, Neil Young and John Mellencamp in 1985 to keep family farmers on the land and has worked since then to make sure everyone has access to good food from family farmers. Neil Young, Willie Nelson and Crazy Horse do “All Along the Watchtower” live at the Farm Aid concert in New Orleans, Louisiana on September 18, 1994. Neil Young – Just like Tom Thumb’s Blues (16 Oct, 1992) is sadly taken down from YouTube… the same goes for the version with better quality on Youtube, but sharing that one is closed. However you can check it out on youtube, and it includes a blistering version of All along the watchtower, we’ll keep searching for them. 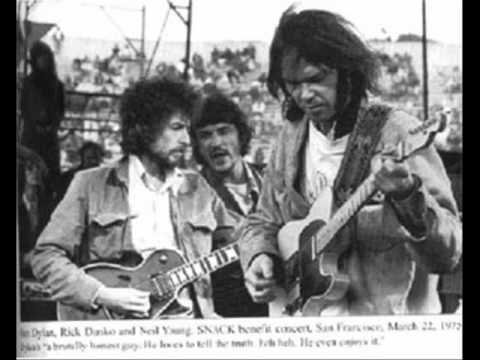 Neil Young do Forever Young with Grateful Dead at the Bill Graham Memorial Concert “Laughter, Love, and Music” in San Francisco, CA. Great intro by Neil! 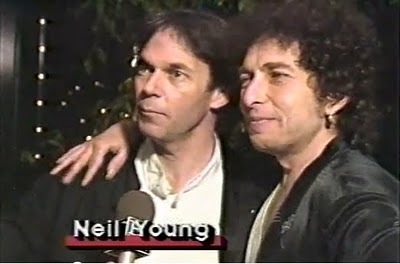 Neil Young and Tom Petty cover a Dylan classic at the 1989 Bridge Benefit Concert at Shoreline. Audio only. Neil Young & Wilco perform the Dylan classic, I Shall be released at the 2008 Bridge School Benefit at the Shoreline Amphitheater in Mountainview, California. I love how Tweedy takes on the role of Rick Danko, great stuff! Lets end with a real gem. On March 23rd, 1975, fifty thousand people filled Kezar Stadium to watch The Grateful Dead, Graham Central Station, Bob Dylan and the Band, Jefferson Starship, Tower of Power, the Doobie Brothers, Santana, Mimi Farina, and Neil Young perform. Featured speakers at the event included Marlon Brando, Joan Baez, and Willie Mays. The concert raised enough money to fund after-school programs in San Francisco schools for another year. Although Bill had been doing benefits ever since he had first opened the Fillmore, SNACK was the first big rock benefit concert in history. From Wolfgang’s Vault: The highlight of the set comes next, when the band plays together on Young’s classic ballad “Helpless.” On this number the loose circumstances actually work in the song’s favor and it sounds quite good with these musicians. As “Helpless” is coming to a close, the group continues playing, and the song flows very naturally into Dylan’s “Knockin’ On Heaven’s Door” – an inspired pairing. It’s a unique version lyrically as well, as Dylan improvises lyrics and changes the chorus to “Knockin On The Dragon’s Door,” a change that’s significance is open to speculation. its the charlie rose show…not rosen…..seriously. PS but can’t be her as she was born in 1987! Looks like Amanda Knox in the audience at 1’10” into ‘Forever Young’ from the Bill Graham memorial concert.. and what a great version of the song! I love Hank Williams, Leonard Cohen, Warren Zevon, Townes Van Zandt and many many more!